The cut of a diamond is a judgment of the quality of the shape, geometry, and finish of a diamond gemstone. The Cut of the diamond is completely determined by the precision and quality of the methods used to cut and polish the diamond. Physicists, Material Scientists, and Gemologists have been studying diamonds for centuries to determine the exact dimensions of a diamond gemstone to get maximum light performance—the brightness, fire, and scintillation that makes diamonds so breathtaking. Note that “Diamond Cut” does not refer to the shape or make of the diamond gemstone. The shapes that Ada offers can be seen here. Gemological laboratories have 5 grades of cut: Ideal, Excellent, Very Good, Fair, and Poor. 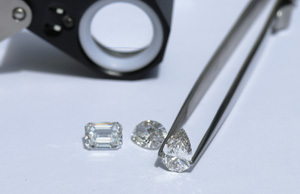 Ada Diamonds only offers diamonds with a Very Good or better cut grade. To understand the differences between an excellent cut diamond and a mediocre cut diamond, you must first understand how light interacts with diamond, as light is reflected and refracted in a very different way than in air, water, glass, or other gemstones. Diamond has a very high refractive index: light slows down in diamond, which creates the brilliance that sets diamonds apart. BRIGHTNESS is how much light you see when you view a diamond. A well-cut diamond has very specific dimensions that reflect and return virtually all of the light that enters the diamond back out of the top of the diamond. Even in poor lighting, a diamond can appear very bright. A poorly-cut diamond leaks light out of the bottom and is dull or flat when compared to a well-cut diamond. FIRE describes the rainbow of colors reflected by the diamond gemstone. Diamond has an extremely high rate of light dispersion. When white light enters the diamond, it is spread apart into distinct colors in a prism-like effect. SCINTILLATION defines the flashes of light that you see when the diamond moves. This is also called the sparkle of the diamond. PATTERN is the contrasting light and dark areas in a diamond gemstone. The better the cut of the diamond, the better the contrast is between dark areas and light areas. Mediocre diamonds have blurry gray areas, whereas the best-cut diamonds have very distinct contrasting patterns that are uniform throughout the diamond. This phenomenon is called Hearts and Arrows in Round Brilliant shaped diamonds.